In most homes, the kitchen is a hive of activity – but that often means it’s one of the main culprits when it comes to household waste too. If you’ve been emptying the bins and feeling pangs of guilt about how much you’re throwing away – wondering how you can create a more eco-friendly kitchen space – you’re not alone. From offices, to schools, to dinner parties the world over, the environmental impact of what we throw away is an increasingly hot topic of conversation. Packaged produce, ready meals, cling film, sandwich bags, carrier bags, bottles…chances are your bin includes at least one of these items. They can feel almost impossible to avoid in a world of modern convenience. But as the world wakes up to the damage being done to oceans and our health by plastic, fortunately alternatives are becoming easier to find. So, if you want to cut back try switching to eco-friendly beeswax food wraps or using cotton and recycled paper bags, stylish jars and tins to store food. Reusable water bottles and thermal cups/flasks are widely available online and in supermarkets, and a quick Google search will show you loads of quick and easy meals you can enjoy cooking at home so you can bypass that ready-meal aisle (reducing cost as well as waste). On the nights when only a pizza will do, there’s no need to throw away the leftovers. Steam ovens (such as the Bosch Series 8 used in some of our kitchen designs) let you combine gentle cooking with the power of hot air, keeping food crispy on the outside and juicy on the inside. In fact, all leftovers will taste as yummy as the day they were made. Not recycling is rubbish for the planet in so many ways. Landfills are overflowing with items that emit toxic waste, potentially risking our health and the survival of the wildlife we love. Whereas recycling preserves natural habitats like forests because we’re not cutting trees down faster than they can grow. We all know this yet, when life gets busy, it can be hard to stay committed to the cause! Make it easier for you and others in our household to recycle by investing in integrated recycling bins that complement the style of your kitchen. If you have room, consider separate bins for paper, plastic, and cans – and compost any food waste to nourish your garden. 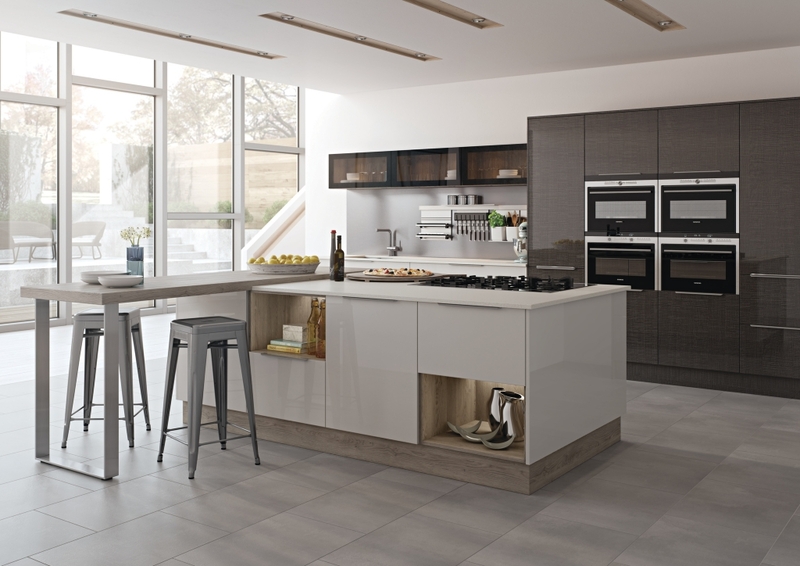 Our customers love the options available as part of Mereway Kitchens’ Cucina Colore collection. It’s not just the small things you throw away daily that can have an environmental impact, your kitchen appliances can too. The materials and chemicals used in their design, manufacture and use can have a negative effect on the environment if not used and disposed of responsibly. If you are buying a new washing machine, tumble drier, dishwasher or electric oven, always go for an energy efficient one. By law, they must carry the European Energy Label. Need a new fridge to update your kitchen? The EU recently agreed on a set of manufacturing laws to make fridges and freezers easier to fix and longer-lasting. Repairers should be able to disassemble critical parts without causing damage that means the appliance needs premature replacement. Invest in a smart fridge you and the environment will benefit from built-in cameras that allow you to see what’s inside the fridge via internet connectivity. When you’re out shopping, you can use your phone to check what’s left in the fridge so you only buy essentials, reducing waste. There are also systems to help you keep track of your grocery’s expiry dates. Pretty clever, right? With a combination of small day-to-day actions, conscious choices and new technology, we can all take steps to protect the earth – and it starts at home. If a new kitchen is on your list of goals for this year, make it happen with a visit to our showroom at 44 The Broadway, Thatcham, Berkshire RG19 3HP. Speak to Caroline and Kevin, who can help you create an eco-friendly kitchen to brighten your world.